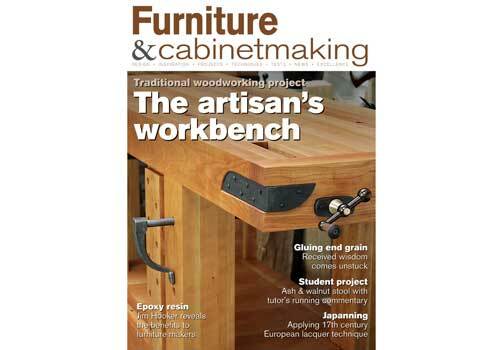 The June issue of F&C sees Richard Maguire showing us how to make one of his custom workbenches and some of Peter Sefton's students take us through the steps for creating a bench stool to completion. Techniques include John Bullar's guide to gluing end grain as well as part 2 of Derek Jones' series on restoring an old Stanley No.5 plane. We also take a look at the ancient art of japanning and discuss whether or not epoxy resin has a place in the furniture maker's armoury. In terms of tests and equipment we take a look at the Festool VS 600 dovetail jig and the Bosch GCM 8 SJL professional compound mitre saw as well as a host of new products in our editor's round up. We bring you further details of two new exciting competitions from Triton and also have all our usual 'your F&C pages' including workshop library, news and events as well as F&CUK. All this and more in issue 206! Why not save up to 42% and download a digital version of the magazine to your iPad or iPhone? Find out more by clicking here.